43 year old male presented with hyperpigmented, scaly patches on his lower back. 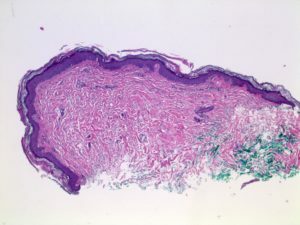 Sections show acanthosis with hyperkeratosis. 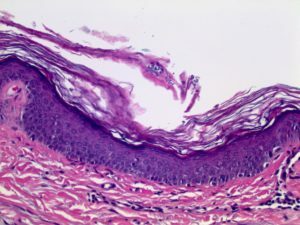 An accompanying spare superficial chronic inflammatory infiltrate is also seen. Higher magnification reveals fungal hyphae and spores.